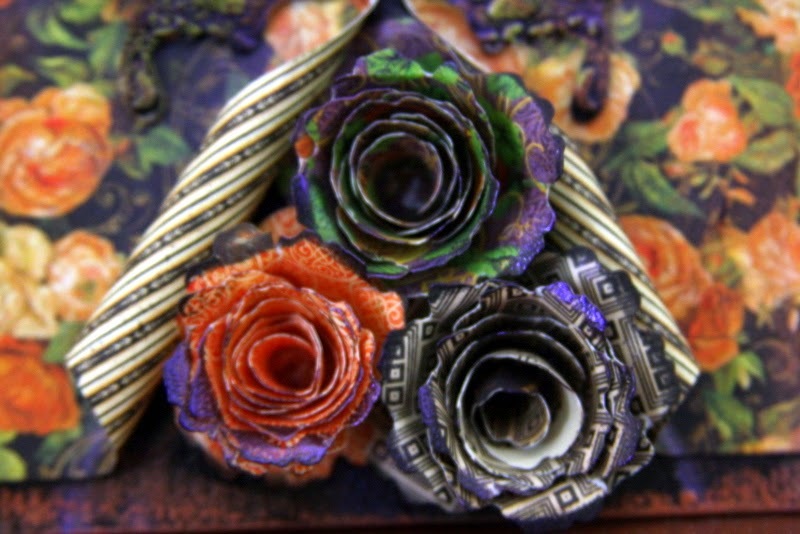 Hi everyone and welcome to the eclectic Paperie Blog! Debbie here with you today sharing my project for this month's ePlay Challenge: Embossing. I have had this paper mache book box in my stash for quite some time now so I dug it out and thought I'd see what I could come up with. Here's my finished book box. Here are some quick directions on how to create this box. Give the box quick coat of black acrylic paint. Decorate the front and with patterned paper, I used an 8x8 paper pad Eerie Tale Collection by Graphic 45. Cut the paper to fit the front cover leaving a border on the top and bottom. Measure over half way on both top and bottom and cut slits about 2 inches towards the center of the paper. Roll the slits as shown and adhere hand made die cut flowers to the center of the opening. The butterfly in the center was die cut and dry embossed with Tim Holtz Alterations - Bigs Die with Texture Fades Embossing Folder- Layered Butterfly and some blank chipboard that I purchased from the eclectic Paperie Store. To embellish the butterfly I painted it black and applied Viva Decor in Copper, Green Yellow and Violet. Next I used my Versa Mark Clear Ink pad to go over the top of the butterfly and flowers and then added embossing powder from my stash. I then re-rubbed with the Inka colors. To finish the butterfly I added a die cut flower to the center. To finish the project I rubbed the whole project with Inka Gold -Copper. Such a beautiful creation. The butterfly is stunning! Oh my word, Debbie, this is gorgeous! I love every single detail. The papers are lovely, the Inka Gold amazing, and the design with the rolled back papers revealing the flowers is so creative. Awesome! This is so gorgeous, Debbie! I just love the flow of the flowers with the beautiful butterfly! What a lovely project Debbie! I love how you have the paper folded back to show the blooms and the beautiful butterfly in the center! Debbie - You knocked it out of the park with this project...simply STUNNING! Love every single layered bit and embellishment...so pretty! Wow, this is absolutely gorgeous Debbie. 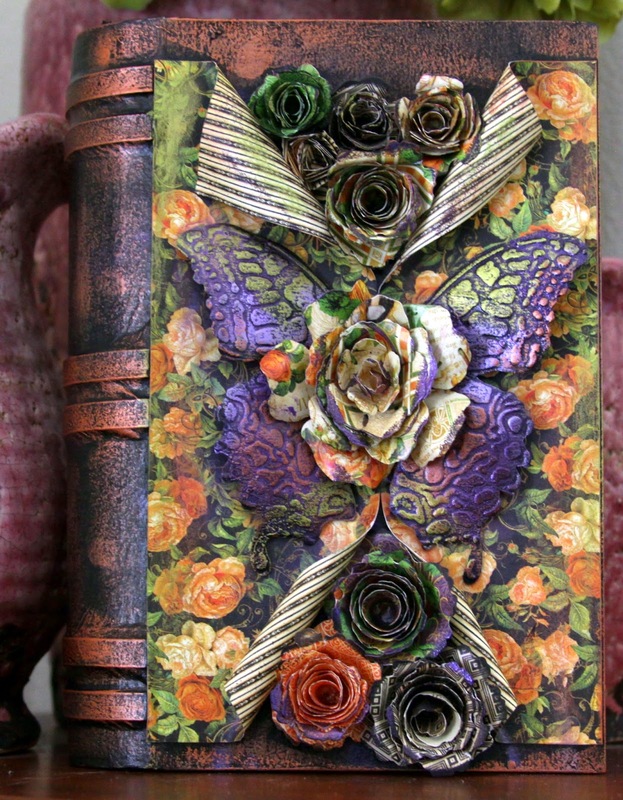 Love the distressed colors on the book and those flower are gorgeous, especially that rolled back paper edge they are nestled in. Love the butterfly! Loved this the minute I saw it on FB. It's AWEsome and I love this collection by G45. Amazing inspiration! I love this! That butterfly is amazing! Thanks for the sweet comments everyone. I'm humbled. Oh how beautiful this is. Fabulous embellishments you added. Amazing result !!! 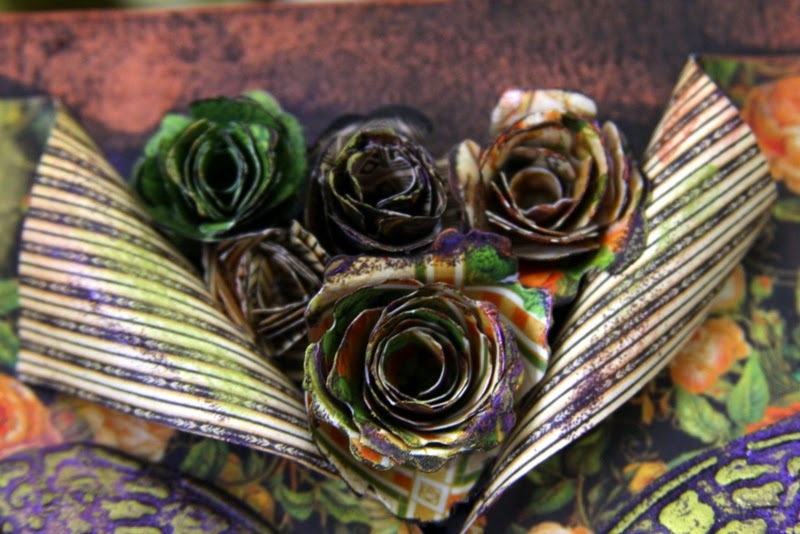 Your flowers, the butterfly, the rolled papers.... Wow... Very impressing !!!! Thank you so much for sharing ! You can be proud of what you created ! !